The peer-reviewed textbook below also provides ancillary resources such as PowerPoint slides, test banks, sample syllabus, etc. Click on the book cover or the book title to learn more about this textbook and to access multiple formats of this resource. 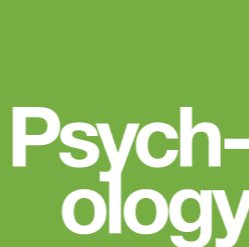 Introduction to Psychology utilizes the dual theme of behavior and empiricism to make psychology relevant to intro students. The author wrote this book to help students organize their thinking about psychology at a conceptual level. 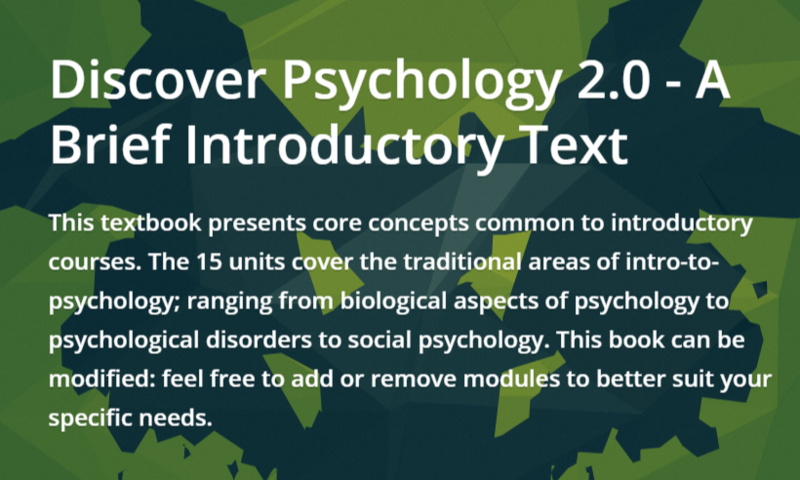 This textbook provides standard introduction to psychology course content with a specific emphasis on biological aspects of psychology. This includes more content related to neuroscience methods, the brain and the nervous system. This book can be modified: feel free to add or remove modules to better suit your specific needs.Please note that the publisher requires you to login to access and download the textbooks. Description: This is a free introductory statistics textbook for undergraduates in Psychology. It is being developed as an Open Educational Resource @ Brooklyn College. It is pitched at the concepts behind statistics, and often uses simulation in R to convey foundational ideas. The writing style is sometimes a bit unconventional, and informal. It is for students who don’t want to like statistics. Description: This is the companion lab manual to our free stats book. It contains lab activities for learning how to conduct statistical tests in R, Excel, SPSS, and JAMOVI. We use open data, often from psychology papers, and show step-by-step how to solve data-analysis problems in each software package. This lab manual is released under a creative commons licence CC BY-SA 4.0. Open Stats Lab (OSL) is a website created by Kevin P. McIntyre, Ph.D., that uses open data sets from articles published in Psychological Science to help teach introductory statistics. For each OSL lab, I've identified studies with open data badges, and then prepared activities that guide students through the analyses needed to reproduce the results reported in the original articles. Intended to introduce both graduate and senior undergraduate students to the foundations of cognitive science, Mind, Body, World addresses a number of questions currently being asked by those practicing in the field: What are the core assumptions of the three different schools? What are the relationships between these different sets of core assumptions? Is there only one cognitive science, or are there many different cognitive sciences? Giving the schools equal treatment and displaying a broad and deep understanding of the field, Dawson highlights the fundamental tensions and lines of fragmentation that exist among the schools and provides a refreshing and unifying framework for students of cognitive science. License: This work is licensed under a Creative Commons License (CC BY-NC-ND 2.5 CA). It may be reproduced for non-commercial purposes, provided that the original author is credited. Important: The textbook is free as a PDF (click on the tab Free PDF). The dollar price refers to the paperback version. This textbook is an adaptation of one originally written by Paul C. Price (California State University, Fresno) and adapted by The Saylor Foundation under a Creative Commons Attribution-NonCommercial-ShareAlike 3.0 License without attribution as requested by the work’s original creator or licensee. This adaptation constitutes the Brooklyn College edition by Matthew J. C. Crump (Brooklyn College and Graduate Center of the City University of New York). This newest adaptation incorporates the second Canadian edition by Rajiv S. Jhangiani (Kwantlen Polytechnic University) and I-Chant A. Chiang (Quest University Canada) and is licensed under a Creative Commons Attribution-NonCommercial-ShareAlike 4.0 International License. And, incorporates the second U.S. edition authored by Dana C. Leighton (Southern Arkansas University) and is licensed under a Creative Commons Attribution-NonCommercial-ShareAlike 4.0 International License. 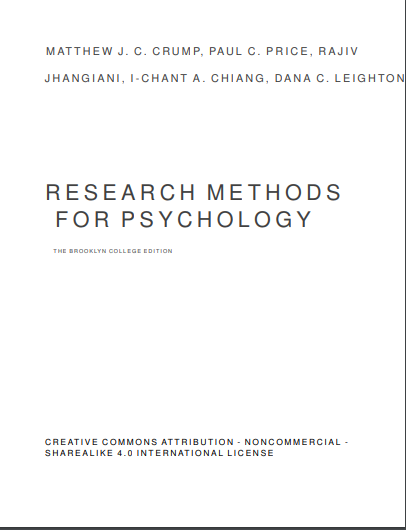 Research Methods in Psychology - Brooklyn College Edition by Paul C. Price, Rajiv Jhangiani, I-Chant A. Chiang, Dana C. Leighton, & Matthew J. C. Crump is licensed under a Creative Commons Attribution-NonCommercial-ShareAlike 4.0 International License, except where otherwise noted. This textbook is based on a critical thinking approach, and its aim is to get students thinking actively and conceptually – with a greater focus on the forest than the trees. Yes, there are right and wrong answers, but the answers are not the only thing. What is perhaps even more important is how students get to the answers – the thinking process itself. 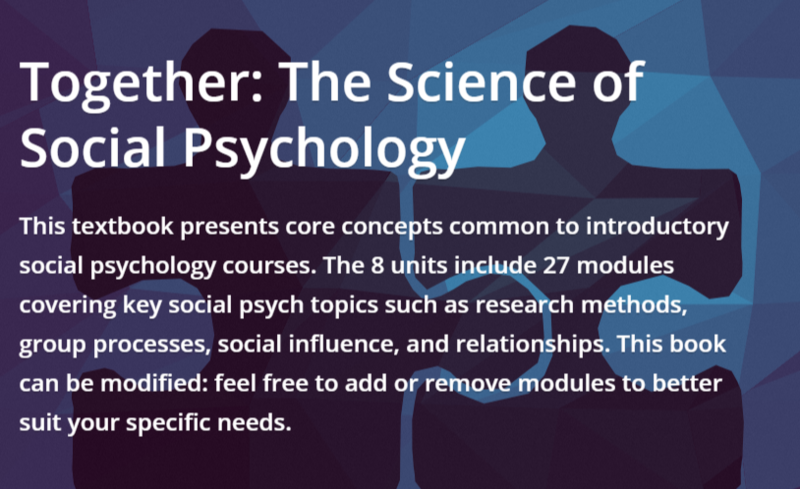 To help students better grasp the big picture of social psychology, and to provide you with a theme that you can use to organize your lectures, this text has a consistent pedagogy across the chapters. License: Principles of Social Psychology by University of Minnesota is licensed under a Creative Commons Attribution-NonCommercial-ShareAlike 4.0 International License, except where otherwise noted. For faculty reviews of this textbook, click here. Noba is a platform that provides high-quality textbooks and other educational materials. Instructor resources include manuals, PowerPoint presentations, test banks, teaching topic essays, quizzes, etc. What sets Noba apart is the fact that their textbooks can be easily customized through their platform. 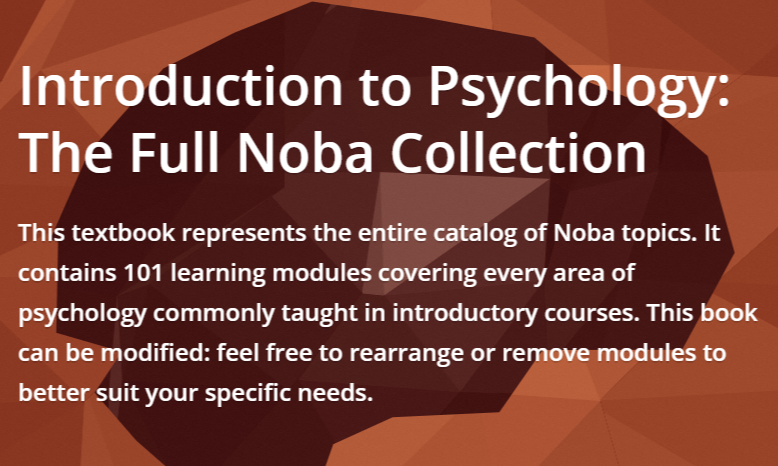 Adding or removing modules to best suit your course is very intuitive.You might even customize your own textbook from scratch, but if you need a place to start, Noba has a collection of ready-made textbooks to make things easier for you. Use them as they are or edit them to your liking. Click on the images to access these open textbooks. Noba's resources are licensed under the Creative Commons CC BY-NC-SA 4.0 International License. Users may reuse, redistribute, and remix the content. OER goes beyond open textbooks. Go Cognitive is an example: this platform offers a range of educational materials on cognitive neuroscience., including demos and interviews with leading scholars. 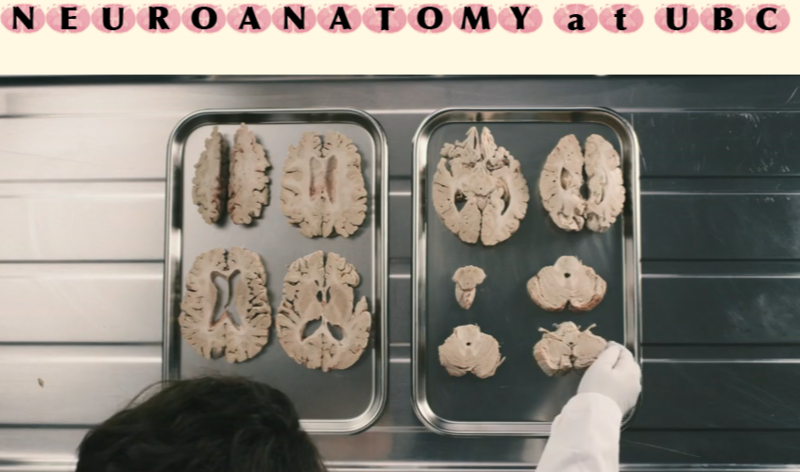 If you teach biopsychology, Neuroanatomy can be a great resource. It includes video tutorials, learning modules, and interactive slices. You can limit your YouTube search by Creative Commons licensed-videos. Adding "Khan Academy" as a search term will help you find more authoritative sources. Khan Academy offers practice exercises, instructional videos, and a personalized learning dashboard that empower learners to study at their own pace in and outside of the classroom. 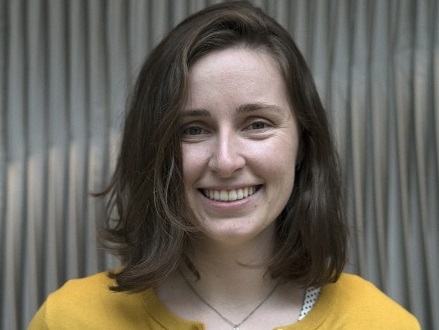 They have also partnered with institutions like NASA, The Museum of Modern Art, The California Academy of Sciences, and MIT to offer specialized content.